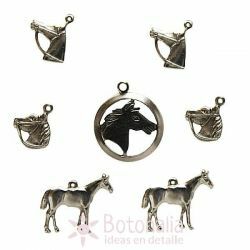 In this section you will find stickers, buttons, ribbons and charms with the theme of horses and riding sports. Product Description: Iron-on sticker (patch) with an embroidery of a head of a racing horse.Content: 1 iron-on sticker.Dimensions: 40 x 50 mm. Max. length: 50 mm.Material: textile. Product Description: Iron-on sticker (patch) round shape with an embroidery of a head of a horse.Content: 1 iron-on sticker.Diameter: 47 mm. Material: textile. Product Description: Iron-on sticker (patch) as a clothing label and design of a horse running fast.Content: 1 iron-on sticker.Dimensions: 30 x 38 mm. Long. Máxima: 48 mm.Material: textile. Product Description: Iron-on sticker (patch) with the shape of a rectangular label and design related to fashion, with crown, horse and rose.Content: 1 iron-on sticker.Dimensions: 63 x 68 mm. Long. Máxima: 90 mm.Material: textile. Iron-on sticker (patch) with an embroidery of a stylized horse running and with lively colors.Dimensions: approx. 40 x 55 mmContent: 1 iron-on sticker.Material: Textile. 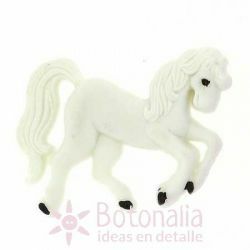 Product description: Button with the shape of a white horse from a fairy tale. Perfect for crafts and needlework, scrapbooking and card making, patchwork, etc. Content: The price is per unit. Diameter: 27 mm. Material: Plastic. Decorative button with the shape of a white pegasus with glitter at the wings. Perfect for needlework projects or patchwork, as well as scrapbooking, card making and other crafts.Content: Price is per unit.Diameter: approx. 31 mm.Material: Plastic. Decorative buttons with the shape of ponies in assorted colors. Perfect for crafts and projects of scrapbooking, cardmaking, patchwork, etc.Content: 5 different buttons.Diameter: approx. 27 mm.Material: Plastic. 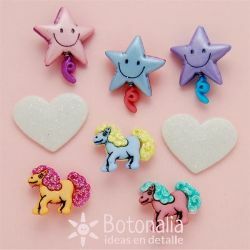 Product Description: Buttons and embellishments with the shape of a pony, star or heart. Ref. Dress-It-Up: 4702. Suitable for craft and scrapbooking, card making and patchwork projects. Content: 6 buttons and 2 embellishments (the hearts). Colors of the ponies may vary from the picture. Diameter: from 24 mm to 31 mm. Material: Plastic. Product Description: Buttons with shapes of farm animals (donkey, horse, pig, cow, sheep, duck and chicken) Ref. Dress-It-Up: 4667. To be used in needlework, craft, scrapbooking, patchwork and card making projects.Content: 7 buttons in different models.Diameters: between 24 to 32 mm.Material: Plastic.